Go inside the Tar Heel locker room with Roy Williams and the team after the Tar Heels beat No. 5 Louisville 72-71 in the Smith Center. 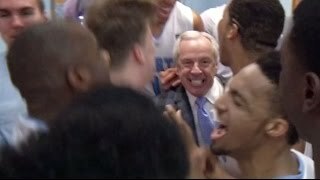 Repeat UNC Men's Basketball: Locker Room Celebration Post Louisville. YouTube; GIFS; Login Sign Up. ... UNC Men's Basketball: Locker Room Celebration Post Louisville. Jan 14, 2015 · Marcus Paige, J.P. Tokoto & Isaiah Hicks speak with the media following the Tar Heels 81-79 win at N.C. State.